Sewing machine cover made from the bottom of my handmade t-shirt wedding dress. Reuse and recycle! Going green absolutely saved me financially, when I was a single Mom to an only! Before Doctor Horrible left us, I had decided to start thinking of ways to save more money, as he didn’t work often and when he did, a lot of his income went to tobacco, alcohol, and drugs. Many weeks I would be handed $20 for groceries for 3 people. After Daryl and I married, I kept these money-saving things going. Here are many of the ways I saved money as a single mom and continue to as a married momma to several more children. Eating healthfully is my number one priority. It’s the most vital thing to be as healthy as possible. It keeps us active and moving, keeps up saving/making money more, and serving others. 🙂 So, I am willing to spend a little more on food than any other area… though, our food budget per month for three was about what my friend’s spend on their standard American diet for three… so we’re not spending “more” in the end, but less (I’ll get to that later). I haven’t done cost-comparison since we’ve added two more, but I doubt we’re spending a heap more than Standard American Diet 5-person families. We order from a co-op here in town, shop farmer’s market in season, get raw honey in bulk from a local beekeeper (it’s cheaper than the high fructose stuff in the store, too), garden, get raw milk from a local farmer for $3/gal (for those that can drink dairy), and are able to get bulk grass-fed beef from a rancher nearby, at $3.50/lb no matter the cut. All of those things have saved us money when we made the change-over to them. I beeswaxed pretty patterned cotton to hold snacks and sandwiches, and I also use them to cover bowls with leftovers that don’t have lids (no more plastic wrap!). We use cotton cloth napkins, too. I make all of our cleaning supplies with natural ingredients. Laundry soap, dishwasher powder/liquid, all purpose cleaning spray, window cleaner. Pennies on the dollar to buying the chemical stuff from the store and I don’t worry about my kids getting into any of it. We don’t do insurance for ethical and religious reasons. Have not had a need to see a dr. in years. When I was single, living in a mold-infested apartment, I was sick about 4-5 times in the last year with various colds, flu, etc. My eldest daughter was sick about the same amount. Within a month of moving out of that place, we were breathing better and had better mental clarity. When we do come down with little illnesses, our botanical treatments re effective and very cheap compared to pharmaceuticals – things like GOOT (garlic olive oil treatment), tinctures, and deep nourishing nutrition. Anyway, I notice that those who eat processed foods tend to be sick far more frequently. They spend a bit of money on cough syrup, decongestants, etc… AND they end up taking off from work to get rest, losing even more money! I bought a menstrual cup and made soft cotton flannel pads. I made cloth bathroom wipes, one side old towel and the other side flannel shirt, with free material. Made old washcloths into cleaning rags. Cut up t-shirts for kleenex. Made little squares (about 1″, and 4-5 layers thick) of flannel to replace cotton pads for cosmetics. As said above, I make herbal tinctures, teas and salves, which are VERY cheap (most of the herbs I utilize are common weeds that are found free where I live!). We do use “deodorant” to some degree. This consists of supplementing with mag-a-hol spray and using milk of magnesia (and no other ingredients) in a glass roller bottle with a few drops of essential oil. When my hubby and I married, I purposed that all our wedding decorations would be reusable for as long as possible in our married life. Table cloths were king size sheets. Our big “wine barrel” was a wonderful find on Amazon, that is actually a rain barrel! 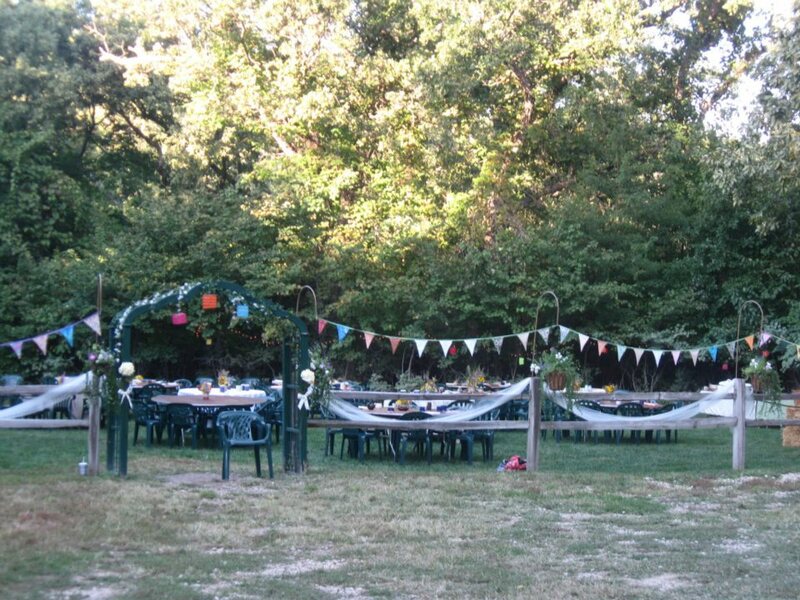 I made bunting banner (and friends sent in triangles with well wishes to add, so special! ), that has now decorated our home several times in the 10 months we’ve been married. I also made paper lanterns with popsicle sticks and tissue paper – they are beautiful little things and have been perfect mood-setters at various celebrations in our married life. I made a canvas banner similar to the one in the Lord of the Rings movie, from Bilbo Baggin’s birthday celebration, with a Hobbiton font, from a laserjet print off backward and orange essential oil – we’ve hung that thing up for birthday parties, Christmas, etc (it says “Celebrate!”). Natural and affordable way to celebrate! 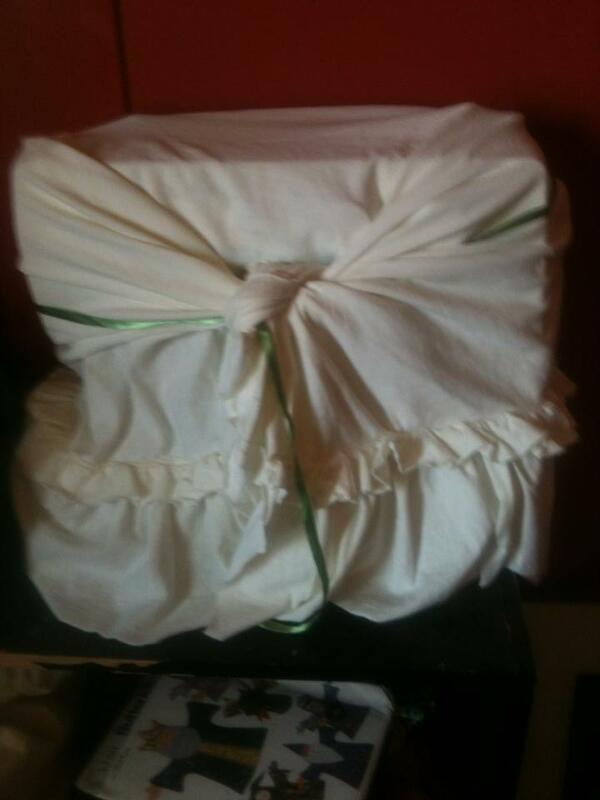 I had a tiny bit of leftover canvas from that, that gave me an idea for our homebirth…. I made a waterproof, reusable pad for our bed (72″x72″) and a smaller one for the livingroom, out of canvas and beeswax. A friend had given us the smaller canvas, and between making the two, at the cost of the larger canvas and the beeswax, it only cost $12!! They were easily cleaned after the birth, and are easy to be wiped down/sanitized (nothing goes through it, so it’s just wiping off the surface). The smaller one is like a small picnic blanket that our youngest children eats on while we sit next to them, and the larger one I made the dimensions that I did, so that I could turn it into a shower curtain! I made flat diapers out of t-shirts people gave me for free and water-resistant/fire-resistant/self-cleaning-when-wet diaper covers from wool sweaters. We put a Moses basket and rocking frame on our baby registry, and when it came, it had a toxic foam mattress in it… so I traced the little mattress out onto poster board, and then cut 6 layers of old, soft towels. I sewed them together and they make the softest resting place ever. We swapped over to all LED light bulbs. We unplug our appliances when not using them (with the exception of washer/dryer and fridge). I line dry as much laundry as possible. We own only one car, and I don’t drive it very much, if at all, on the days that I have it. I love swapping ideas on how to live frugally and eco-friendly at the same time! Some of this stuff seems like it’s expensive at first – and it is, if you have someone else prepare all your eco-friendly/organic stuff for you…. but doing it yourself actually saves a LOT of money, compared to even the “cheaper” non-organic lifestyle. I hope some of this can help! Do you have any ideas to share for healthy, money saving changes? Share in the comments, please!